The Broke and the Bookish : Anna Karenina Fans? We've got a fun giveaway for you! 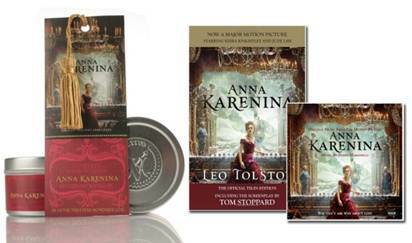 It's no secret that lately the big buzz in book to movie adaptation is Anna Karenina by Leo Tolstoy -- which came out November 30! It's one of those books that I've read and put down numerous times but I'm vowing to read it so I can see it while it's still in theaters. I was automatically excited about it because I LOVE Focus Features as they've produced some movies I really loved (Match Point, Lost in Translation, Eternal Sunshine of the Spotless Mind anyone?). And naturally I have an interest in book to movie adaptations. So, this is what we've got for you! If you haven't seen it yet, check out the trailer! - Leave a comment with your email to enter! Tell us something -- if you read/liked the book, what you thought if you've seen the movie, if you think they'll do a good adaptation, etc. Anything related to this particular book/movie or maybe your fave classic book to movie adaptation. Ooh, I've always wanted to read this! And will definitely need to before seeing the movie. My email is ashley.holstrom@gmail.com. Thanks for the giveaway! I've been wanting to read this. It looks like something I would enjoy. I havne't read it yet, sadly. But the book to movie adaption looks nice. I enjoy Keira Knightly though, especially when she is in these types of movies. =] Excited for both the book and movie. Hopefully I shall have time to read the book before the movie. Awesome Giveaway! I am actually in the process of reading the book right now. I have the issue of wanting to read a classic for ages, and oftentimes it takes a movie adaptation coming out to kick me into gear. All the same, I MUST read the book before seeing the movie. Thanks for the giveaway! My email is lostgenerationreader[at]gmail[dot]com. I've always wanted to read this but never have. I loved Keira Knightly in Pride and Prejudice and that version is actually my favorite! I also loved the recent adaptation of Jane Eyre that came out in 2011! I have not gotten to read this book yet, although I do have it in my Nook! The movie looks really good, and excited to see it! You don't have to enter me in this giveaway. I just wanted to say that I am reading this book right now and I think I'm in love. When I finish it, I am going to go see the movie and I can't wait to see how good it is. I read the book and loved it. The book is so rich, so I hope the adaptation foes it justice! This has been on my list to read for a really long time now (I partly blame Rory Gilmore) but I have seen the preview and the movie looks amazing. I cant wait to see the movie, I love Keira Knightly! I've never read the book....I know, I know, shame on me! Can't wait to see the movie and would love to read this book! I have to fall back to A Christmas Carol by Dickens as the best book to movie adaptation. I know that seems like a cop-out, but it really is a great one. Ever since the trailer came out, I've been dying to read the book and see the movie. It looks so good!! My favorite classic book to movie adaptation... I haven't seen that many, but I'm hoping the new Gatsby movie will be good. I'm a bit of a Joe Wright fangirl, so I definitely want to see this. He has such an eye for beauty!! Moreover, The contents are masterwork. you've performed a wonderful process in this subject! I read and enjoyed very much this book, decades ago, in French! time to watch the movie, and re-read again, in English this time. thanks for the fun giveaway! What a fantastic giveaway! I've not read the book or seen the movie yet. I saw an interview of Keira Knightley recently in which she was promoting the film. Did you know she struggled with dyslexia as a child? Now, she says, reading is only difficult if she's very tired. I haven't read the book, but it looks pretty, and yay for soundtracks!! I actually just read this (on my kindle, yay for public domain!) just so i could see the movie! Super excited! Everything I've heard makes it seem like Wright's has an interesting adaptation. I adore Keira Knightley as well as period dramas so that's why I really want to see this. I have not read the book, but my reading plan for 2013 is to read many of the classics that I've missed over the years. This would be a great addition to that plan! My e-mail is brokencookiesdontcount@gmail.com. Thanks! I started reading the book over the summer but I put it down really quickly. I can't wait to see the movie though, it looks beautiful! I'm hoping it will push me to get the book read! I loved the movie adaptation of Atonement it Anna Karenina seems like it will have a similar feel (at least visually. I don't think it will be a disappointment. I hope to read the book first and then see the movie. Thanks for the chance to win! I've been meaning to read the book for years (more than I care to admit), but I always get distracted by something else. (Probably urban fantasy.) However, I REALLY want to read the book before I see the movie, which looks absolutely gorgeous in the previews. I haven't seen the movie or read the book, but it sounds and looks great! Thanks so much for the chance to win! Really a great story but such a challenging book to read. I think it's great that this film will make it accessible to so many people who otherwise would only know of it as a classic book but never enjoy it. Ah yes, my email: carlscott(at)prodigy(dot)net(dot)mx. I am excited for the movie, although ideally I would like to read the book first. I have started it twice, but unfortunately allowed other books and things to take precedence. I really want to read it, though, so I'm hoping the release of the movie (and a little free time) will allow me to do so. I am also very intrigued how the movie is shot in a theater, so it's like a play version is being filmed. Sounds like lots of layers! My favorite classic book to movie adaptation is probably Gone with the Wind. The movie was amazing! It was stressfully whimsical and featured one of the more creative directional choices in recent years. It was also the most elegantly choreographed nervous breakdown I have ever seen. Never really wanted to read the book, but am more interested since I found out a movie was being made. Glad for the giveaway! 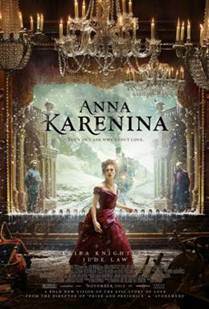 I finished reading Anna Karenina just a few days ago in anticipation of seeing the film. Haven't seen it yet, but I'm really looking forward to it! Joe Wright's one of my favorite directors. I can't believe I haven't read Anna Karenina! I've honestly watched the trailer at least 20 times, and I can't wait to finally see the movie next week. I've heard many good things about this book! I can't wait to see this in the theatre! I do want to see the movie first, then read the book, so that I won't be disappointed! (Just in case). Awesome giveaway!